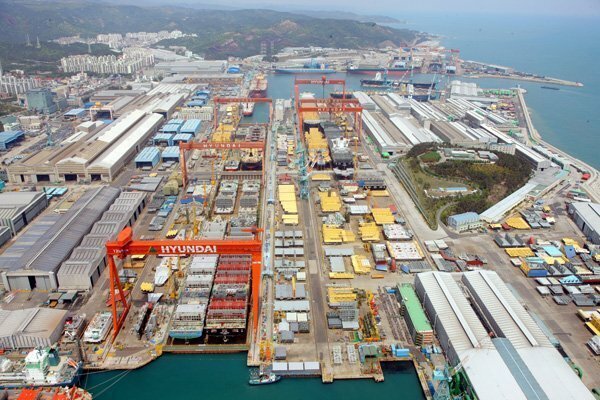 The Korean government is looking into the closure of Hyundai Heavy’s Gunsan yard, trying to find a solution to keep it open. The new Korean president, Moon Jae-In, pressed by local politicans, said earlier this week that the nation’s prime minister has been in touch with Hyundai Heavy to seek a way to keep Gunsan up and running. The yard faces being mothballed from July 1 as its orderbook runs out. HHI began to build its Gusan yard in May 2008 at the peak of the last supercycle in shipping. The president of the nation at the time, Lee Myung-bak, was on hand for the official groundbreaking ceremony. By the time it was completed the following summer, however, the markets were in post-Lehman shock. The Gunsan yard is enormous; spread over 1.8m sq m and features one of the world’s largest drydocks, some 700 m long with a huge 1,600 ton crane.